Click here for the 2011 version of this post. This is the first of 6 organizational reviews of the pitching staffs of our various affiliates for the 2012 season. Unlike in 2011, I didn’t follow nearly as closely as I would have liked, so a lot of this is “analysis in arrears.” This is also a lot of “scouting the scoreline,” which isn’t always a fair way to evaluate pitchers, but a full year’s worth of work is also a big enough sample size to pass some judgement. I’ll try to evaluate pitchers at the level at which they spent the most time and will offer guesses for next season. Also, rehab appearances are not mentioned or given analysis in these posts. After reviewing all the staffs at each level, I’ll cull the above predictions into a summarized 2013 projected staff throughout the system. Syracuse starters. 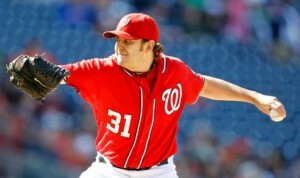 The rotation started the season with Atkins, Roark, Maya, Lannan and Duke. This wasn’t exactly the way these guys would have lined up 1-5 (since Lannan was dumped to the AAA roster at the end of Spring Training unexpectedly) but this is the order in which they appeared to start the season. Lets talk about these 5 guys plus other prominent starters for the year. Mitch Atkins: Syracuse’s opening day starter stuck in the rotation for most of the year, posting a 5.28 ERA while going 6-9 in 20 starts. He improved on his season numbers with a handful of relief appearances down the stretch, finishing the year with a combined ERA of 4.87 in 118 1/3 innings pitched. This minor league Free Agent pickup from Baltimore’s organization never gave the team a reason to consider calling him up, and probably is out the door in the off-season. Outlook for next season: Minor League Free Agent again, likely with another team. Tanner Roark: He posted an ugly W/L of 6-17 on the year in 28 games (26 starts). He had a 4.39 ERA with a 1.41 whip in 147 2/3 innings on the year. He had pretty good K/9 numbers (130 Ks in those 147 innings) but also walked a goodly number of guys (47). He mostly got promoted after a similar season statistically in AA by virtue of the AAA depth being shredded by the Gio Gonzalez trade. Outlook for next season: He’s Rule-5 eligible but not yet a 6-year free agent. I guess its possible he gets picked up, but he’s not worth protecting. I think he gets one more season starting in AAA before reaching minor league free agency. Yunesky Maya: After getting several shots at the major league level in 2011, Maya was buried in AAA for 2012. There he toiled a complete season as a starter, posting an 11-10 record in 28 starts. His era and whip were respectable (3.88 and 1.19 respectively), but his softer-tossing ways did not lead to the kind of swing and miss stuff craved by the current regime (just 89 Ks in 167 innings despite his ability to throw everything but the kitchen sink). He improved upon a rough early start to the season with a series of gems in August … but would routinely follow up a gem with a stinker. The big club has learned its lesson and left him off the expanded roster. Outlook for next season: Maya has just one more year on his 4yr/$8m contract, after which he’ll be cut loose to try his wares elsewhere. But he’ll be back toiling as AAA’s #1 starter in 2013. John Lannan, as most Nats fans know, was the surprise cut from 2012’s major league team and basically served as injury insurance the entire year. He did not necessarily help his own cause in AAA, putting up mediocre lines of 9-11, 4.30 era, 1.44 whip and barely 5 k/9 despite a MLB-average pedigree. He did however perform excellently in two spot starts in the majors, setting himself up to be the Stephen Strasburg replacement in September’s stretch run. I’d cough up his poor performance to a season-long disappointment over his predicament; he’s got to be the highest paid guy in the minors (now that Kei Igawa‘s contract expired). Outlook for next season: Lannan is just about a 100% guarantee to be non-tendered at the arbitration deadline and certainly looks to sign on with another club. Zach Duke: Unlike Lannan, Duke took advantage of his time in AAA and DID regain some value; he posted a 15-5 record in 26 starts and 164 innings. The rangy left-hander was cut loose by Arizona after the 2011 season and did enough with Syracuse this year to earn a September call-up. Outlook for next season: Likely a free agent again and likely to use 2012’s performance as a springboard with another team looking for starter help. Jeff Mandel, a long time Nats farm hand, started the year in AA to provide some starter depth before coming back to AAA and eventually replacing Atkins in the rotation. He was 6-3 with a 2.41 ERA in 11 Syracuse starts and filled in effectively down the stretch. Outlook for next season: He’s finishing up his 6th minor league season and didn’t get a 40-man call-up (at least not yet). He has one more year of team control before hitting minor league free agency. AAA rotation. Erik Arneson, who continues his 2011 role of organizational swiss army knife, filling in with innings wherever possible. Outlook for next season: probably continues to be the Nats org guy; he’s still effective in AAA. Austin Bibens-Dirkx, who got a couple spot starts before getting released and eventually getting picked up by Colorado Springs (AAA affiliate of Colorado) to finish out the season. Outlook for next season: with another organization. Kevin Pucetas got called up from AA to make one spot-start. Outlook for next season: See the AA wrap up for more details. Christian Garcia has turned into one of the Organization’s great stories of 2012, posting a 0.86 ERA in 52 1/3 innings between AA and AAA after being claimed off waivers from the Yankees in late 2011. This performance earned him a well-deserved call-up to the big club as rosters expanded. Additionally, he’ll be featured in the Arizona Fall League as one of our three pitcher representatives. Outlook for next season: He’s got a big arm, can bring it 97-98, and should be in the mix to be a middle-relief arm for the Nats bullpen in 2013. He likely replaces what the team sought in Brad Lidge and provides insurance against injury (or, in Cole Kimball‘s case, failure to recover from injury). Atahualpa Severino put in a decent season for Syracuse (2.81 ERA in 48 ip), but clearly he lost favor with the team. Instead of considering Severino (who was on the 40-man at the time), the Nats picked up Mike Gonzalez off waivers and promoted him up to the big club. Furthermore, Severino was DFA’d off the 40-man and passed through waivers without being claimed, never a good sign for a long-serving minor leaguer. Outlook for next season: Minor League Free Agent, though the fact that nobody claimed him when he got DFA’d means he’s likely an Org guy from here on out. But, LOOGYs live forever, and he can bring it, so maybe he gets a shot elsewhere. He’s clearly been passed over in this organization. GWU grad Josh Wilkie was having a so-so start to his Syracuse season (his 4th year in the league) before getting suspended 50-games in June. [Editor Note: thanks to Mark L. for pointing this out]. Wilkie was summarily released after his suspension ended. Outlook for next season: with another organization. Ryan Perry failed to make the big club out of spring, pitched briefly in Syracuse’ bullpen before getting sent to Harrisburg to re-make himself as a starter. Outlook for next season: see the AA version of this post. Mike MacDougal made his “triumphant return” to the organization after washing out of Chicago’s AAA affiliate in Iowa. He struck out 14 and walked 8 in 10 innings for Syracuse (about what I expected); no word on how many WP he threw. Outlook for next season: minor league free agent again. Erik Davis got 8 late season appearances after toiling mostly in AA and earning a promotion. Outlook for next season: see the AA version of this post. Hassan Pena improved on his 2011 stint in AAA but still looks like a middle-of-the-road minor league reliever. He was suspended at the end of the season for suspected “team rules violations,” a question mark for him going forward with the organization. GWU grad Pat Lehman continued his march up the organization, earning a quick promotion up to AAA and posting respectable numbers there. Corey VanAllen got demoted and then hurt. Rafael Martin also got demoted after a crummy start. 2012 Minor League free agent signings Jeff Fulchino and Waldis Joaquin didn’t throw a single inning in 2012, spending it entirely on the 7-day DL. Syracuse should have had a better record than it ended up with (70-74) given the quality of the starters on this team (a long time MLB starter in Duke, a career sub 4.00 ERA starter in Lannan and a guy on an $8M contract in Maya). But at the same time, a combination of trades and a “gap” in organizational development led the team to have to fill a significant portion of this staff with minor league free agents, so it may have been inevitable that the team would have struggled. « What one game would you travel back in time to see? Subscribe to comments with RSS or TrackBack to 'Syracuse/AAA Pitching Staff Year in Review; 2012'. The Nats released Wilkie when he finished his suspension. I didn’t even know. I’m so far behind the times on minor league news this year. I’ll put an edit into the post… hey, I predicted it though right? Yeah, it’s too bad, Wilkie would have been a great story, local undrafted boy makes good. Rizzo would have never given him a chance regardless because he didn’t throw hard enough. Hope he hooks up with someone who gives him a chance. There’s a few more local guys we can root for. Pat Lehman is also GWU and made it to Syracuse himself this year. The team also drafted Bobby Lucas late in 2011. And they got Michael Bowden from uMaryland in 2012. And amazingly they’ve got a guy from Georgetown (Erick Fernandez). They havn’t drafted from George Mason in 5 years and only have a handful of draft picks from the Virginia powerhouse teams (UVa, Va Tech, The baseball at local colleges is so weak. Interestingly to me, look at our past few drafts and look how Southwest-heavy the picks are (Texas, Oklahoma, Louisiana). In 2012 I count 9/40, 2011 7/50 (with a handful more from Mississippi and Arkansas), and in 2010 fully 16 of 50 picks from mostly Texas schools. I guess we have some strong-opinioned area scouts down there.